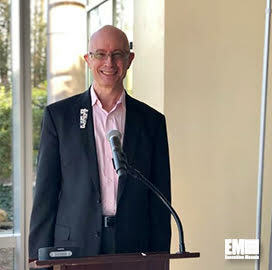 On Wednesday, April 10th, GovCon leaders from public and private sectors gathered at the 2941 Restaurant in Falls Church, Va. for Potomac Officers Club’s 2019 Data Management Forum. The forum featured a panel discussion about augmented data management, and Michael Conlin, chief data officer for the U.S. Department of Defense, opened the forum with a keynote address. After an introduction from the forum’s moderator Shaun Bierweiler, vice president and general manager of Cloudera’s U.S. public sector, Conlin’s keynote address focused on enhancing oversight and management while trying to improve affordability and performance for the Department of Defense. Conlin explained that his intent is for the department’s performance to be as efficient and productive as possible to receive maximum value for American taxpayers and the department. The department created a baseline budget covering 75 to 80 percent of its internal functions to solve that issue and establish a direct comparison against the most efficient industry practices. “That’s the art of generating those insights so leaders can make proper decisions about where to push and pull to lift the performance of the DoD,” Conlin said. As the department pivots into the performance space, the arguments intensify inside the department about the best methods to proceed. Conlin explained that DoD hasn’t been managed on a department wide basis. As a result, the culture is built on “experience-centric decision making, not data-centric decision making,” he said. Conlin expressed a strong desire to change the culture because the department works with approaches that are 30 years old. He used the example that the IT industry continues to advance at an incredible rate, but GS position descriptions for IT professionals were written over 30 years ago. He stressed the importance of data science and revealed that the U.S. government is far behind in data science training. Data scientists are scarce in the region, and the department doesn’t have enough specialists because recent graduates in the field receive lucrative salaries in the private sector. Conlin mentioned that DoD has “change control boards,” which he sarcastically renamed “change prevention boards” because they are roadblocks that make it difficult to make significant changes in production. Meanwhile, U.S. adversaries don’t possess the same restrictions or regard for ethics, which is a big reason why China is dominating leading edge research in artificial intelligence and machine learning. “We need to be able to counter our adversaries with a faster rate of change,” he said. In closing Conlin reiterated that hiring talent and building a data science team are extremely important to the department’s future. “I need talent to change the culture,” he said. Conlin revealed that he can recruit talent from non-profit universities, treat them as valuable employees and potentially pique their interest in federal government service. He said most federal agencies are dealing with a similar set of challenges with talent and culture changes. “The level of desire to make improvements is very high, and people are actively pushing hard to improve the performance of the department,” he said. The Potomac Officers Club will host the 2019 Cybersecurity Summit on May 8th at the Ritz-Carlton in McLean, Va. GovCon leaders from the public and private sector will discuss new cyber programs, initiatives and technologies influencing the industry and how both sectors can better collaborate to achieve common goals. You can register for the event here.